Find huge deals in Miyagi, Japan that you may book now & pay later! Best prices for in Miyagi, Japan. A dream vacation for you and your family, guaranteed by our travel consultants. For members-only deals, we recommend using the new filter for deals in Miyagi, Japan. This lovely hotel can be found in Akiu. Densho Sennennoyado Sakan features a total of 173 units. Guests can take advantage of the internet access at Densho Sennennoyado Sakan. This property does not accept pets. There is a car park at Densho Sennennoyado Sakan. Guests may choose to pamper themselves at the health facilities available at the hotel. A fresh, clear water carrying stream, a traditional Japanese garden alloted full of various colorful flowers and trees, thus having botanical garden qualities, the cuisine using fresh ingredients from mountain and sea, a peaceful relaxing hot spring and a indoor swimming pool where You can swim all year around are waiting to be enjoyed by You. Located on high ground that can see the view of Matsushima" which is counted as one of the three most beautiful views in Japan." 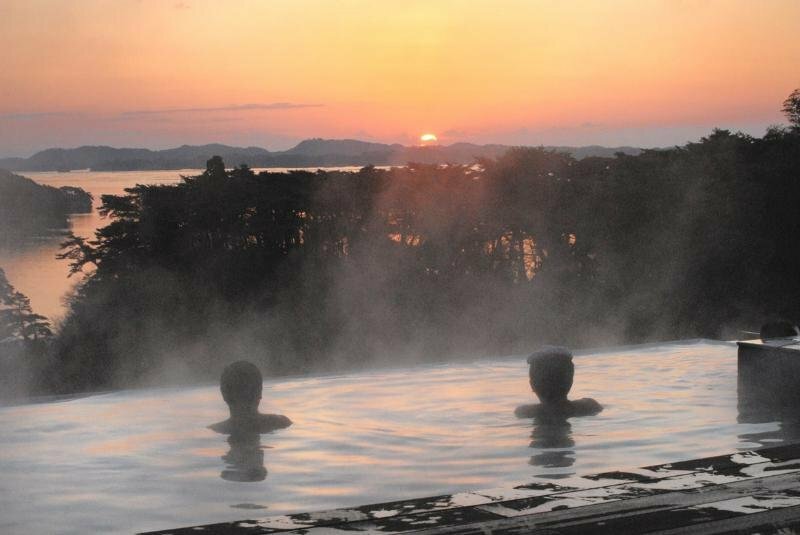 The beauty of the silhouette of the island Matsushima in the sea – Especially from the observatory spa right next to the sea, the “outlook bath”, the view onto Matsushima island is well worthwhile. 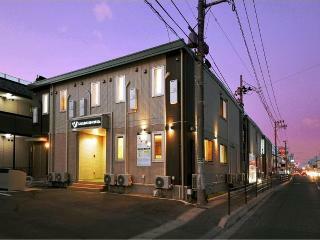 In this original type hotel Japaneses and Asian style is fused in to a harmony not to be held before. We also offer rooms with private open air hot spring bath from which the view onto the Matsushima bay can be enjoyed. This charming hotel can be found in Akiu. The 173 welcoming guests rooms offer a perfect place to relax at the end of the day. Pets are not allowed at this establishment. Enjoy the view of the abundant nature of the island of Matsushima from Your room, as the hotel is located right next to the sea. This inn serves as a perfect base for touristic trips to the famous and historic places scattered around the surrounding area. This lovely hotel can be found in Akiu. This property does not operate a 24-hour reception. This accommodation does not accept pets. Equipped with open-air baths and the family baths blended with the nature. Guests are welcomed with the Chef's specialty meal. Anywhere in our establishment the elegant Japanese garden can be enjoyed. The establishment is build in traditional Japanese style of tea ceremony houses, never higher than two floors. 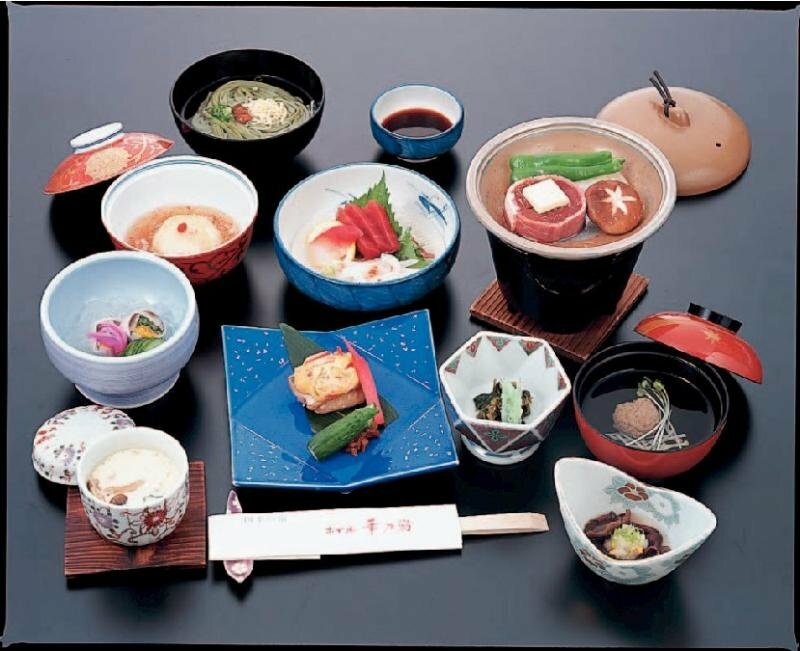 As for the cuisine, we serve tea cermony style set menus changing according to the four seasons, reminding of Japanese festivals and the special taste of Mutsuno. Located in the Akiu hot spring resort, this resort hotel offers mainly western style rooms but also a chapel. Besides our stairwell lobby, our contemporary reinforced concrete five store building is surrounded by vivid green nature. This hotel also offers an abundant hot spring and an art museum. We will welcome you with flowery interior in which orchids are used as a motif, and with Kaiseki dishes using carefully-selected fresh materials. In our Japanese garden"
This lovely hotel is situated in Osaki. This comfortable hotel can be found in Minamisanriku. Being located in the traditional hot spring resort of Naruko which has an over 1000 year old history since its opening in the Heian time, it keeps being deeply loved by the people since the old times as the “bath of the beautiful skin”. Because this is a resort hotel, You can appreciate the openhearted atmosphere and feel Yourself beautiful. With only 24 rooms, You can peacefully relax. Don`t You want to spend Your days of in luxury? This simple hotel is situated in Matsushimakaigan. This charming hotel is set in Minamisanriku. This lovely hotel can be found in Minamisanriku. This charming hotel is situated in Minamisanriku. This lovely hotel is located in Minamisanriku. This comfortable hotel is in Minamisanriku. This lovely hotel is in Osaki. This charming hotel can be found in Osaki. This comfortable hotel is located in Osaki. This charming hotel is in Osaki. This comfortable hotel is set in Matsushimakaigan. This lovely hotel is set in Matsushimakaigan. This unpretentious hotel can be found in Matsushimakaigan. This charming hotel is situated in Matsushimakaigan. This charming hotel is located in Matsushimakaigan. This comfortable hotel can be found in Matsushimakaigan.